You deserve to write the perfect camp counselor resume. Take a bit of Indiana Jones’s charisma, add MacGyver’s resourcefulness, and mix in Mary Poppins at her best. That’s how you picture yourself as a camp counselor. The problem? So do the other 299+ candidates. Follow this guide, and you’ll prove to the camp director that you are the Indiana MacGyver-Poppins they’re looking for. A camp counselor resume better than 9 out of 10 other resumes. How to write a camp counselor resume that will land you more interviews. Tips and examples of how to put skills and achievements on a camp counselor resume. How to describe your experience on a resume for a camp counselor to get any job you want. Here’s a sample resume for camp counselor positions made with our online resume builder. Sample Camp Counselor Resume - See more templates and create your resume here. As a camp counselor, you must demonstrate great organizational skills and the ability to prioritize. By laying everything out in the reverse-chronological format. This good ol’ trusty format will be just right in the vast majority of situations. It will help you keep your camp counselor resume nice, clean, and organized. Make good use of white space. Clean headings. Resume-friendly fonts. One more thing. Save your camp counselor resume as a PDF, so it doesn’t get scrambled when opened on a different computer. After all, you’re not applying for a cryptography job. Now, let’s move on to the first section of your camp counselor resume. Camp Counselor Resume Objective or Summary? Say hello to Steve, the camp director. Steve has just yawned. And that was a big yawn. He’s about to take a look at the 74th resume this afternoon. Steve has jumped out of his chair in a fit of overpowering joy! He’s seen your camp counselor resume summary, and he just knows you’re a perfect match with bags of experience. That’s right: a resume objective or summary done right works magic. It must be brief, but it must speak volumes. And that’s exactly why it’s tricky. English Literature student with a flair for photography. Eager to enhance camp goers’ experience by organizing entry-level photography and sci-fi literature courses at Camp Wolverine. Friendly English Literature student. Wants to gain work experience. Can take photos. The first candidate doesn’t have too much experience, but has a lot to offer. She’s full of ideas and knows how she can help. The second aspiring counselor doesn’t know how to market themselves. Not to mention they’re a taker, not a giver! To paraphrase a classic line: it’s 70 percent how it looks, 20 percent how it reads, and 10 percent what it is actually about. If you decide to go for a camp counselor resume summary, follow the same rules as with the camp counselor resume objective, but focus on your track record. Take a look at right vs. wrong camp counselor resume examples. A dedicated and well-organized camp counselor. Coaching background. Mentored 3 new camp counselors last summer. Implemented programs and conducted activities for groups of 15+ campers. Won local Lifeguard Games 3 times. A camp counselor and a coach. Likes to organize events. Worked as a lifeguard. The difference is visible right away. Not only does the first example offer facts and figures. It uses them to highlight impressive achievements others might have overlooked. Coaching background = Mentored 3 new camp counselors. Well-organized = Programs and activities for groups of 10+ camp goers. There isn’t much to talk about when it comes to the wrong example, though. It’s generic. It’s something anyone can say. And say it they will! Who knows, maybe their background is incredible, but it simply doesn’t show. Remember: a resume summary will be useful for you when you already have some experience, and you’re preparing a senior camp counselor resume. If your experience is limited and you’re making a junior camp counselor resume, go for a resume objective instead. the camp director’s eyes are glowing like campfires. He feels you’re legit, but he needs to double-check. Now he’ll make a beeline for the experience section. And that’s where you’ll seal the deal. List all your past responsibilities and achievements that fit the position. Select 3-5 that you’re really proud of, and use them in your camp counselor resume experience section. 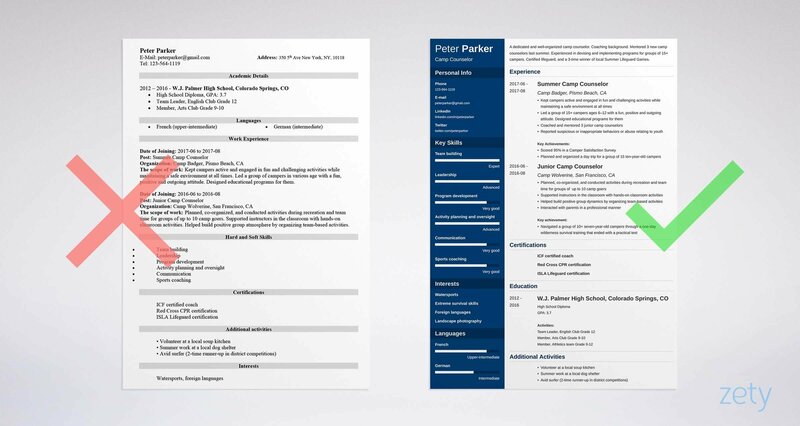 Take a good look at these two camp counselor resume examples. It lists achievements, not responsibilities. It uses numbers wherever possible. Numbers speak louder than words. The wrong camp counselor resume sample missed all three. It reads like a laundry list of stuff that any camp counselor does. Remember, camp directors are familiar with all camp counselor duties. They wrote the very ad you’re replying to. They want to know how well you’ll handle those duties. Use the experience section of your camp counselor resume to your advantage. Always double check if it contains action words, lists achievements, and quantifies them with numbers. If you do that, you’ll never go amiss! 2. No experience? Go and get some! Do freelance projects, babysit, organize an event, or start a local club. Look for opportunities in your local community, or school. Be creative! Be active! If you believe your camp counselor resume experience section is wanting, think of all the cool stuff you like doing in your spare time. How might it be interesting to the camp goers? Do you speak French like Bradley Cooper? Paint like Van Gogh? Act like Shia LaBeouf? Love BASE jumping and spelunking like Batman? Talents and soft skills will always boost your chances of landing that job. "We look for people with a variety of experiences who can demonstrate a true passion for values they believe in. We also look to hire staff who can show demonstrated proficiency in their areas of expertise, are able to hold engaging conversations, and can demonstrate a desire to make impacts in people’s lives." Remember Steve, the camp director? Time to impress him with some great skills on your camp counselor resume. Think of the skills necessary to carry out the duties of a camp counselor. Rule no.1 is: resist the temptation to copy-paste these skills. Mix them in the experience section of your camp counselor resume. The right example cleverly mixes in skills, presents responsibilities in terms of achievements (by using active voice and action verbs), and adds numbers here and there to quantify what’s possible. Got more skills that don’t really require special treatment, but are valuable nonetheless? Include them in a separate skills section. So you’ve got a diploma. Or not. Does it matter? It does, but only if you know how to use it to your advantage. According to the Bureau of Labor Statistics, the better qualified and experienced you are, the higher your chances of finding either part-time or full-time camp counselor positions. The more impressive your educational track-record, the better. But don’t simply plonk your school name and graduation date and move on. Don’t be shy: add all extracurricular activities that may set you apart from the other candidates. Don’t limit yourself to the name of the college. Add the coursework relevant to the position — it clearly shows you know what skills might come in handy as a camp counselor. How about a Cover Letter for a Camp Counselor? It’s time to grab Indiana Jones’s hat and crack the whip! To fly away like Mary Poppins with her umbrella! To... grow a MacGyver mullet! Before you click that submit button, make sure to put the icing on that resume cake of yours, and write a cover letter! Communication skills matter a whole lot when applying for a camp counselor position. And yes: the data is in. Cover letters still matter even though most tell you they don’t. When writing a cover letter, aim for the Goldilocks principle — it shouldn’t be too long, or too short. It should be just right. Tell them everything you want in as few words as possible. Show you’re organized. Tell a story to fill in the blanks you might have left on your camp counselor resume. A bit confused? Worry ye not! Here’s our complete guide on how to write a perfect cover letter in 8 simple steps. Craft your camp counselor resume for a particular position. A generic looking document will never grab anyone’s attention. And it most definitely won’t give you a job. Start off with writing a strong opening statement (objective or summary). Follow it with a meaty experience section (list your achievements). Are you writing a resume for a camp counselor position for the first time? Or perhaps you’re a camp veteran eager to help young guns out? Give us a shout out in the comments! A complete guide to help you list volunteer work on your resume. With volunteer resume sample and tips from experts.